For much of the last few months, I've been in a reading slump. I wish I could say why, but there's really no good reason - do slumps ever really have a true cause? Anyway, I'm slowly digging my way out of it, and just in time, as another Book Expo America is now, uh, on the books. Book Expo always makes me feel so optimistic...I've gotten all these books, I think to myself, and I'm actually going to READ them all! That rarely happens -- my intentions are good, but my follow-through is lacking -- but I still wouldn't miss it. Even if I don't ever make my BEA-related reading goals, it's incredibly valuable to me, both personally and professionally, to see what people are excited about reading and just to be in the company of so many people who love books and, like me, spend their lives with them and around them. I also, like many others, have a conference tradition of pictures with whatever wacky things are wandering the conference floor -- Elvis, Oscar the Grouch, the dummy from the "For Dummies" books...This year, there was Bad Kitty (though that picture seems to reside on my BEA-pal Heather's phone) and, more importantly, everyone's favorite intergalactic bounty hunter. 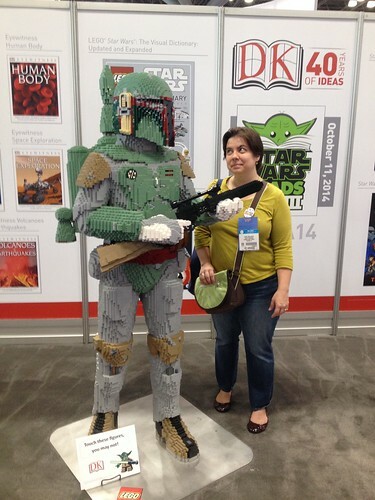 Saturday was Reed Expo's first ever "BookCon" and...well, it was something. I won't go on at length about it but I will say that it was way too crowded (this picture hints at the crowds but doesn't really do them justice) and I was VERY glad that I had a "professional" badge and could go anywhere on the show floor rather than being confined to the BookCon section. 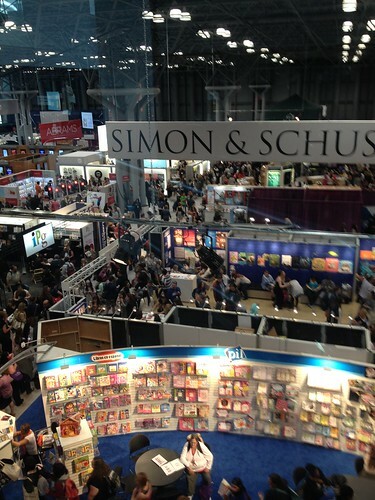 I don't mind crowds as a general rule, but BookCon was making me feel seriously claustrophobic and anxious. All in all, it was a fun and productive two days -- and who knows? Maybe I'll actually make a decent dent in that big to-be-read pile: less than two weeks out, and I've already finished three books, which, considering that aforementioned reading slump, is AMAZING. Yay books! The Last Policeman was one of my favorite books of 2012, and I've spent the year since I read it talking it up to friends and library patrons. I cheered when it won the 2013 Edgar Award for best paperback original. But mostly, I've been eagerly awaiting the sequel. After all that waiting, I was quite pleased to see that Countdown City didn't disappoint. In this second book in the trilogy, there are 77 days remaining until the asteroid Maia slams into the Earth. Civilization is continuing to crumble -- utilities and communications systems are shutting down, food and other necessities are growing scarce, and society has become a strange hybrid of anarchy and martial law. But Detective Hank Palace, formerly of the Concord Police Department, does his best to carry on with his life as normally as possible. When his former babysitter asks him to help find her missing husband -- a difficult prospect at best in a world where so many have "gone bucket list" -- he takes on the task, since fundamentally he still believes in law and order and a society with rules and right and wrong, even in a world where not many people do. As with The Last Policeman, the biggest strength of the book is the depiction of life in an increasingly desperate world. The book shows an interesting cross-section of humanity -- those who have quietly accepted their fate; the profiteers; the people who believe that the whole situation is a conspiracy that they can put an end to. There is an unasked question that winds itself throughout the book: Reader, what would you do? Who would you be? William Shakespeare's Star Wars is the book I didn't know I was waiting for. (Is that too clunky to be a "these aren't the droids you're looking for" reference?) What could possibly be better for an English-major-slash-scifi-movie-geek? I may well be the only English major in the history of the universe to have graduated without having taken a single class in Shakespeare. I love seeing his work on stage, but reading drama has never been something I enjoy. Despite this, though, I had no trouble at all reading through this book (though, certainly, my familiarity with the source material helped matters). The pacing is good and it is a fast read. The length of the book is on par with that of Shakespeare's plays (according to the afterword, it has 3,076 lines while Shakespeare's longest play, Hamlet, is 4,024 lines) yet, to me, it felt much shorter. This is a fun, quirky little book for all you literary-minded geeks out there (and I know you exist -- I'm friends with a lot of you). It's head and shoulders above other similar concept books I've read over the last couple of years: if Ian Doescher could write over 3,000 lines that scan properly here, there's no excuse for certain popular picture-book parodies to have such poor rhythm. Many parodies have a clever premise but fall short in the execution, but this is the rare one that is realized perfectly. Review copy received from Quirk Books. Publication date July 2, 2013. When I was a child, I had a brief children's biography of Nellie Bly. While it didn't go into great detail about her life, it did talk about how she got herself committed to the Women's Lunatic Asylum on Blackwell's Island and, especially, her later trip around the world. I read it over and over again and, when I got older, I was always surprised that there wasn't much written about her -- I never really sought anything out, to be fair, but a lot of books cross my path on a daily basis and I never saw one about her. I was thrilled when I saw the announcement for Eighty Days and the book shot right to the top of my to-read list. Eighty Days not only tells the story of Nellie Bly, it also introduces us to Elizabeth Bisland -- while I knew about Bly's trip around the world for Joseph Pulitzer's World newspaper, I'd never known that Cosmopolitan (a much different magazine in those days), upon hearing of the stunt, sent Bisland, their own reporter, around the world in the opposite direction in the hopes that she would beat Bly. Bly and Bisland were very different women, but both were largely self-made and well-known in their day, and the intersection of their stories is fascinating. Sections of the book detail the increasingly sensational stunts that the New York newspapers of the day attempted to pull off in an attempt to win readers; other sections; other parts read like a travelogue, as seen through the eyes of two women who were not seasoned travelers and yet set out to beat Phileas Fogg's fictional record for a circumnavigation of the globe. They traveled on the fastest steamships of their day, traversed the newly-built Suez Canal, took rickshaw rides in the Orient, and survived harrowingly fast trips through the Rockies on the newly-completed Transcontinental Railroad. Following their return to New York, Bly found her life changed drastically, and never again found the fame and public adulation that she enjoyed during her trip. Bisland's star did not fall as far, but she, too, fell into relative obscurity. I found Eighty Days to be a fascinating and absorbing read. At times it fell into some repetitiveness (due, no doubt, to the nature of Bly and Bisland's dueling trips) so it did drag a bit in places, but the content more than made up for its shortcomings. Review copy received from the publisher via NetGalley. As someone who often doesn't have the attention span for larger projects, I have long been a fan of the "One-Skein Wonders" series, edited by Judith Durant and published by Storey. We all have those single skeins of yarn kicking around -- leftovers from another project, perhaps, or expensive yarns we could only justify buying one of -- and these books contain patterns for dozens of items using these small amounts of yarn. While the other "One-Skein" books have included crochet projects, this is the first one devoted entirely to crochet. The book contains 101 patterns for all kinds of projects -- there are the scarves and hats one would expect, of course, but also pouches and other bags of various sizes; felted items; fingerless gloves; doll clothes; baby items; household items such as pillows, doilies, and tea cozies; toys; jewelry; and even a couple of adult-sized shrugs (obviously, with only a single skein of yarn, adult-sized garments are, largely, out of the question!). The patterns do not fall into crochet stereotypes, either -- while they obviously build on traditional motifs, there is much more here than just granny squares and shell stitch. There are many items here that I would LOVE to make and own; one of my favorites is the Sunflower Pillow (pictured on the upper left corner of the cover), which takes advantage of a gradient yarn to create a striking design. I also am in love with the various toys in the book, especially the adorable Sam the Big-Bottomed Bunny. As with the others titles in the series, this book is arranged by yarn weight, from thread all the way up through bulky. While some patterns call for expensive or otherwise hard-to-find yarns, plenty of patterns are crocheted using craft-store brands such as Caron, Red Heart, and Lion Brand, as well as yarn store staples like Berroco and Brown Sheep Lamb's Pride; the arrangement of the book by yarn weight makes it easy to substitute yarns. I have only rudimentary crochet skills, and while many of the patterns in the book are far beyond my skills, there are a few that I could make easily. In general, though, the book seems to be aimed at people who are at least at an advanced-beginner level; I would recommend that a beginner consult a different book for instruction before tackling any of the projects here. 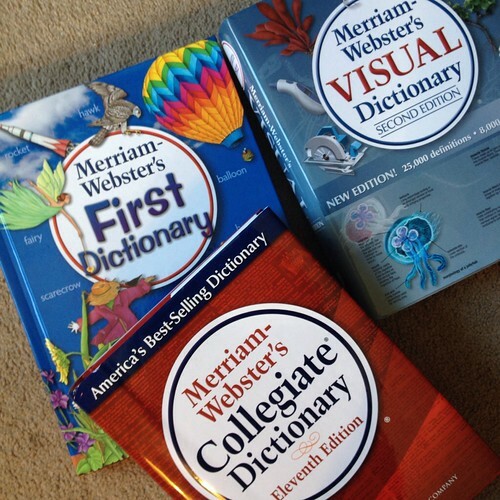 There is a brief, illustrated glossary of terms in the back, but this is a pattern book, not a technique book. While I am not a skilled crocheter, this book makes me want to be one, and it certainly deserves space on the shelf of any crocheter looking for fun, quick projects. Review copy received from Storey via NetGalley. The year is 1845, and 24-year-old Hannah Price spends her nights watching the stars from the widow's walk of her modest Nantucket home. She has spent her life in the company of her father and her twin brother, fixing chronometers and scanning the heavens; what she dreams of is to discover a comet and thus win the King of Denmark's Prize. But in this mid-nineteenth century Quaker community, there is no room for a woman to pursue her scientific dreams. When her brother and father leave the island, Hannah is faced with the prospect of abandoning her studies and her dreams. In Hannah, debut novelist Amy Brill has created a thoughtful, plucky heroine based on the real-life "lady astronomer" Maria Mitchell. Hannah does, eventually, make her long-anticipated discovery and earn her way into the astronomical community, but not before sullying her reputation due to a relationship with Isaac Martin, a black sailor, and cutting her ties with the Quakers. The Movement of Stars reminded me very much of Tracy Chevalier's Remarkable Creatures, another based-on-a-true-story novel about a self-taught female scientist struggling to find her way in a male-dominated profession in a time when women did not even have the vote. In both books, I appreciated the glimpse into the lives of these great female thinkers, and seeing how difficult it was not only to make their voices heard, but simply to be able to pursue their intellectual goals at all -- something many of us take for granted today, I think. For me, though, where Brill's novel lost some of its strength was in its predictable, somewhat trite romance between Hannah and Isaac; using it as a plot device to drive Hannah's Path to Self-Discovery seemed, to me, to be the easy way out. Still, though, I found the book to be absorbing and enjoyable; in addition to the main plot, I also appreciated the look at Nantucket society at a time when it was very much in flux, changing from an old whaling port to the seaside summertime haven it is today. ARC received as part of First Flights, the Penguin Debut Author Program. Expected publication date April 18, 2013 from Riverhead Books. 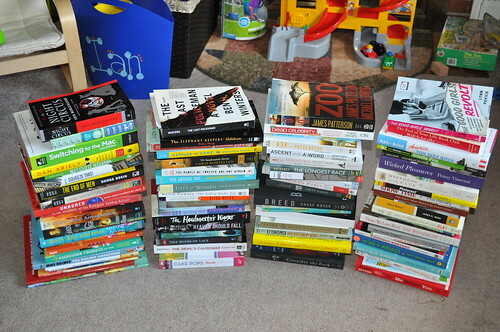 And now, the annual book round-up! My haul from Book Expo America, back in June. My favorites of the year: Alice Bliss, Destiny of the Republic, The Night Circus, Mrs. Kennedy And Me. Honorable mention: The Last Policeman. Having just tallied up all of these stats, I'm shocked to see just how many books I read on the Kindle. I knew that I was reading more because of it; I just didn't realize how much more! I really do attribute my huge jump in reading (last year I read 41 books, but didn't even hit 10,000 pages) to the Kindle: I have it in my bag all the time, whereas I don't always have room for print books. And even when I do have room to carry a book, it takes more effort to remember to grab the one I'm reading, for some reason. I used to flip through magazines on my lunch break at work; now instead I always have a book on hand. Clearly it's paying off! I'm quite pleased, too, to see my fiction/nonfiction numbers closer together this year. I do love my nonfiction, but in recent years I've really been ignoring novels, and I guess I must have missed them. I still blame Anita Shreve for turning me off them for some time. Stupid A Wedding in December. 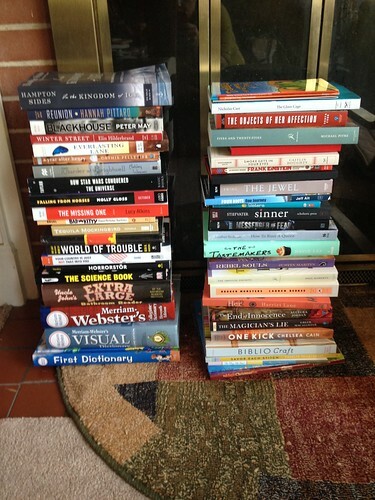 My goal for the year was 52 books -- a book a week -- and I did it! I had a few little slumps where I didn't read much of anything, but made up for it with several binges, like my Ian McEwan mini-marathon of several weeks ago, not to mention all the books I managed to read while on vacation. Part of me wanted to set a higher goal for 2013, but the other part kept admonishing that first part to keep it reasonable. So 52 it is, once again. One change coming up in my life this year: a commute, which is something I've never really had before! So I may need to enter the world of audiobooks. We'll see. I've never been a huge fan of them, but I'll have an hour and a half in the car each day now. NPR may not be enough amusement! I've gotten a bunch of new craft books for the library in recent weeks and have really been enjoying flipping through them. I swear, if I spent as much time crafting as I do reading about crafting, I would get SO MANY projects done! After reading this book, I want to decoupage everything in sight (confession: I did indeed run out and buy several different kinds of Mod Podge and started working toward that goal!). Where Mod Podge Rocks! really shines is in its description of basic decoupage techniques and, especially, the explanations of the different formulas of Mod Podge -- I'm sure I'm not the only person who didn't know there were so many kinds, or that you could decoupage on, and with, so many different types of materials. There are more than forty projects in the book, divided into three categories: home decor, jewelry and other wearables, and holiday projects. The holiday section was what appealed to me the most: there's something about seasonal decor that just always makes me want to haul out the glue gun and other craft supplies. There is a Christmas-themed glass block project that I really want to make, and an adorable Halloween countdown calendar that would be easily adaptable for use as an Advent calendar. The biggest surprise? A decoupaged bike helmet. It would never have occurred to me, not in a million years, to do this, but I hate my boring black bike helmet (I have a mens'-sized head, though, so there aren't cute helmets that fit me!) and I am really going to have to try this. Some of the projects themselves as presented in the book are not to my taste, but the ideas are solid and there is a lot of crafty inspiration to be found in these pages. Will I decoupage my world after reading through this book? You bet. Watch out, animals and small children. When I was a child, I had two favorite crafts: those "stained glass" suncatchers that one makes by filling a frame with small plastic pieces and then baking, and Shrinky Dinks. With both, there was just something so cool about the transformation of plain old plastic into something shiny and pretty. I'm an adult now, and I am STILL fascinated by Shrinky Dinks, so I was delighted when this book crossed my path. I honestly had no idea that one could buy shrink plastic outside of the little kits we had as kids (nor did it occur to me that one could use #6 plastics from the recycling bin! ), and the very idea of inkjet-printable shrink plastic makes me positively giddy with excitement. To my mind, this book is the perfect marriage of childhood nostalgia and adult design taste (not that there aren't things in the book that would be very appealing to kids! ), and I am really looking forward to shrinking some plastic in the very near future! The fact that Thomas Jefferson introduced macaroni and cheese to America is relatively well-known -- maybe it's just the nerdy circles I travel in, but it's one of those pieces of trivia that seems to be tossed around with some regularity. But did you know that Jefferson tried to smuggle rice out of Italy, or that he tried to establish olive-growing in South Carolina? This thin volume touches on a number of different topics. Far from simply being a culinary history, it covers a lot of ground: Jefferson's experiences as a diplomat alongside Benjamin Franklin and John Adams (one of my takeaways from this section: "minister plenipotentiary," what we would now call an "ambassador," is one of the most impressive-sounding job titles around), the beginnings of the French Revolution, race relations in eighteenth-century France, Virginia plantation life, the Jefferson family, and more. The book provides an overview of a number of these subjects, but I was really left wanting more; I see more reading about several of these topics in my future. The historical record of James Hemings's life is quite thin, but what little material there is provides a fascinating look at not only Jefferson's foray into French cuisine and entertaining styles, but also into the life of a man who was, as far as slaves go, quite privileged. James Hemings and his siblings were fathered by Jefferson's father-in-law, and of course by now everyone knows about the relationship between Jefferson and Sally Hemings, James's younger sister (though the events in this book predate that); the dynamic between the Jeffersons and the Hemingses sounded quite interesting to me. 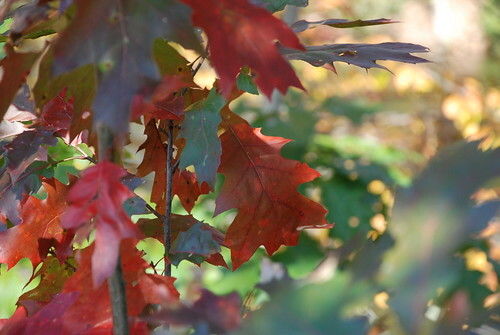 The book The Hemingses of Monticello has crossed my path several times; I may be compelled to pick it up now. I would recommend this book to anyone with even a passing interest in early American history, or in pre-Revolution French life. Because the book just sort of scratches the surface of a number of different topics, it provides valuable context without getting bogged down -- and if you're at all like me, your interest will be piqued and you'll want to check out one or more of the books in the rather extensive bibliography that Craughwell provides. And also, if you're at all like me, you'll come away from the book craving macaroni and cheese in the worst way. Review copy provided by Quirk Books. Thank you! This last week, I decided that I was getting way too stressed out, largely about external things (like politics). So I decided that, at least temporarily, I am adopting a modified "head in the sand" approach to life -- I am trying very, very hard to avoid overloading myself with news and other negative things that were making me anxious, with the idea that there's a happy medium between "being informed" and "being so informed that you want to go live on a deserted island somewhere and become a hermit." So far, it's working quite well. I'm also trying to be better about keeping the dishes washed (we don't have a dishwasher, so it's VERY easy to let them pile up), the toys picked up, and the kitchen table cleared off -- and after a couple of weeks of working on that, I am feeling less stressed at home, too. These are the sorts of things that Gretchen Rubin talks about in Happier at Home. The book is very similar to The Happiness Project (which I read some time ago) but with an emphasis on...wait for it...life at home. Rubin's theory is that, whether or not you are a generally happy person, there are still things you can do which will make you happier -- an idea that, I think, has a lot of merit. I don't read Rubin's books as self-help so much as memoir and inspiration. Her life is very different from mine, and some of the things that make her happy are not at all on my radar (like her excitement at being able to do work on vacation --sorry, not for me!). But she makes me think about the sources of stress in my life, things I have guilt about, and ways to work on those things in an effort to make myself happier. There's nothing earth-shattering here. Many of her ideas are ones that you might find in any number of books dealing with simplicity or mindfulness or decluttering: Start small. Do one thing at a time. Clear space in your schedule. But, at least for me, there is value in reading about how someone else tackled these things, and the successes (and difficulties) she had along the way. While I appreciated the memoir-ish tone of the book, there were times when it felt like it veered into being a little too personal, in ways that didn't seem relevant to the ideas at hand (and, in many cases, were just redundant); I would have edited it a little differently. In all, I found both this and The Happiness Project to be valuable reads. I don't necessarily want to have a full-on Happiness Project, and if I did, my goals would not be the same as Rubin's, but reading about her efforts to improve her own life gave me good ideas about how to improve mine. I don't know how long I'll be able to keep up the "don't read too many political stories" thing, but seeing how it has affected my mood has been really eye-opening -- and I have to thank Gretchen Rubin for even planting the thought in my head. Advance copy received from the publisher --and signed by the author! 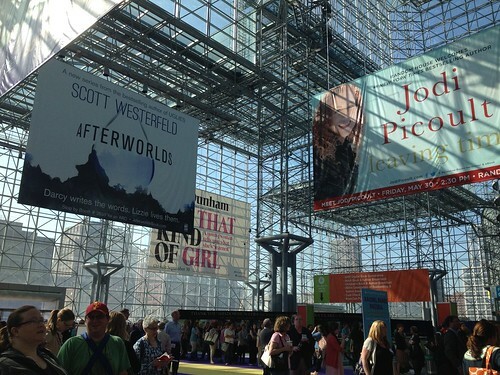 -- at Book Expo America. Publication date 9/4/2012. James Patterson is not an author who appeals to me, generally. The sorts of thrillers he writes aren't my usual thing; I tried one once and could neither get into it nor get past the language: there were far too many sentence fragments for my liking. It's a writing style I don't mind in moderation, but when authors overuse it, it grates on me like almost nothing else. Zoo, though, with its promise of a Michael Crichton-esque plot, sounded more to my liking than Patterson's usual oeuvre, so I picked up an ARC at Book Expo and decided to give it a whirl. Zoo did indeed, as I was expecting, read like a Crichton story. Animals all over the earth are going berserk, behaving in unprecedentedly bizarre ways and attacking humans with no provocation. Isolated incidents become more and more frequent, and eventually they can no longer be covered up or hidden from. Humans are being hunted everywhere, whether by lions in the wilds of Africa or rats in New York City. Biologist Jackson Oz -- who has little credibility in the scientific community, having dropped out of his PhD program at Columbia -- has been sounding the alarm about this frightening animal aggression, but people only start listening after the attacks can no longer be ignored. As with so many thrillers, the plot is pretty preposterous and has holes you could drive a truck through, and there are some "twists" that are easily spotted from a mile away (not to mention a couple of plot points that are left dangling entirely, never to be resolved), but it moves along quickly. I found the ending unsatisfying; in the last quarter or so of the book it becomes clear that Patterson is (rather clunkily) using the book to deliver a message about technology and the environment. "Subtle" is clearly not a word in his vocabulary. The pacing of the action at the end was strange, too: it moved very quickly from a sort-of-resolution into an epilogue (and, honestly, even the last few pages before the actual epilogue) that seemed tacked on, somehow, as if he wasn't quite sure how to wrap things up after the climax. It was a reasonable enough way to end the story, but it just felt very clumsy, somehow, to me -- it seemed very hurried and didn't flow with the rest of the book. Despite all of this, I can't say I didn't enjoy the novel. The premise was interesting, and I certainly wanted to know what was going to happen next. If the ending hadn't fallen flat for me, I probably would have given it four stars rather than three. It would be interesting to see what a different writer -- someone who more frequently writes this sort of scientific thriller -- would have done with the story. Having escaped from Australia's Adelaide Zoo, an orphaned platypus named Albert embarks on a journey through the outback in search of "Old Australia," a rumored land of liberty, promise, and peace. What he will find there, however, away from the safe confinement of his enclosure for the first time since his earliest memories, proves to be a good deal more than he anticipated. The book was really well-reviewed (I had to read the review several times to be sure, because it just sounded SO weird), so into my cart it went. I swear I haven't thought about platypuses (platypi?) in years, and now suddenly they're everywhere. Who can we blame? Is it Phineas and Ferb? Are platypuses the new vampires? If I start a band anytime in the next few months, I'm totally calling it Platypus Moment. When Bee gets a perfect report card, she reminds her parents that they promised her anything she wanted: and what she wants is a family trip to Antarctica. Thus begins this quirky novel about precocious Bee, her Microsoft-engineer and TED-star father, and her eccentric, misanthropic mother Bernadette. Bernadette was once a promising architect, the recipient of a MacArthur "genius" grant, but has become a recluse in Seattle, a city she hates, depending on a virtual assistant in India to do even the most mundane tasks for her. Bernadette's strange story is told in emails, a TED talk transcript, a magazine article, instant messages, etc., with some narration from Bee thrown in throughout. Towards the end of the book, though, it switches suddenly to being narrated entirely by Bee, and as a result this section felt very disconnected from the rest of the story. I liked the concept of the story being told in different ways by a number of different people -- except that, to my mind, the voices of the characters weren't really differentiated from each other. The emails and articles all sounded like they were written by the same person, and the emails, in particular, didn't read at all like how people actually write (unless these busybody Seattle mothers were all closet novelists). For some reason, I just wasn't able to let my "suspension of disbelief" module kick in when it came to those emails. This book has so many glowing reviews, I feel like I must be missing something...but it just didn't do it for me, really, which is too bad because I'd been looking forward to it so much! I didn't dislike it, certainly, but for me it just missed the mark. Still, though, it's a quick, enjoyable, funny read. Everyone's got their celebrity obsession, and I've confessed before that mine is the British royal family. On top of that, I'm definitely an Anglophile, too. So as you can imagine, between the Diamond Jubilee and the London Olympics, I've been enjoying 2012! I found this to be an absorbing book. It really isn't a biography of the Queen, per se, though: it's more of a history of the House of Windsor and how the monarchy has changed since the reign of Elizabeth's grandfather George V. (I would imagine that most people who are close enough to the Queen to be able to provide an "intimate portrait" are also discreet enough to not spill her secrets. There is a discussion in the book of the Queen's governess, Marion Crawford, who wrote an affectionate memoir of her time with the then-Princess Elizabeth and her sister Margaret; she was never forgiven for her betrayal of the family confidence.) Marr makes it a point to talk about the Queen's relationships with her various prime ministers, which helps to illuminate the role, limited though it may be, that she plays in British politics and government. So there you have it. Let's all assume that Her Majesty enjoyed the pageantry of the opening ceremony more than the pictures of her might have suggested!